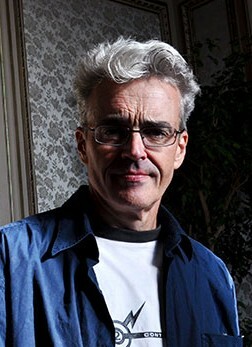 Quizás no exista un dibujante que haya intentado trascender una y otra vez dentro del medio de los comics que Eddie Campbell. El oriundo de Glasgow ha llevado su versatilidad al extremo para incursionar en todo tipo de géneros. Siempre empujando a su oficio como narrador y al arte secuencial hacia adelante, siempre con algo que decir. De finísimo trazo e inclinado notablemente hacia el naturalismo, y con obras que van desde lo comercial hacia lo más personal, Campbell es el ilustrador entre ilustradores. En julio de 2004, Campbell publicó en los foros de discusión online de la revista “The Comics Journal” lo que llamó El Manifiesto de la Novela Gráfica, un documento que define lo que es, que demarca a sus alcances y objetivos, colocándola en un pedestal diferente e incomparable al de la prosa con ilustraciones. Desechando términos que la limitan—tales como formatos, géneros y otras—y desdeñando algo suntuoso como “Novelista Gráfico”, Campbell intenta concebirla como una fuerza intangible e ideológica, un vehículo útil que conduzca al comic hacia otras latitudes literarias y hacia un mercado y compra potencial. There is so much disagreement (among ourselves) and misunderstanding (on the part of the public) around the whole subject of graphic novels, that it’s high time a set of principles were laid down. I am not interested in organizing a “summit” or a symposium and drawing up a bill of rights or any of that crap, but here’s what I mean when I use, or understand when I hear, the words ‘graphic novel’ (or when I create one, for that matter). Since we are not in any way referring to the traditional literary novel, we do not hold that the graphic novel should be of the same dimensions (whatever they may be) ie. page count. Thus subsidiary terms such as ‘novella’ and ‘novelette’ are of no use here and will only serve to confuse onlookers as to our goal (see below), causing them to think we are creating an illustrated version of standard literature when in fact we have bigger fish to fry; that is, we are creating a whole new art which will not be subservient to the arbitrary rules of an old one. Graphic novel signifies a movement rather than a form. Thus we may refer to ‘antecedents’ of the graphic novel, such as Lynd Ward’s woodcut novels but we are not interested in applying the name retroactively. Since the term signifies a movement, or an ongoing event, rather than a form, there is nothing to be gained by defining it or ‘measuring’ it. It is approximately thirty years old, though the concept and name had been bandied about for at least ten years earlier. As it is still growing it will in all probability have changed its nature by this time next year. The goal of the graphic novelist is to take the form of the comic book, which was once a medium worthy of cultural attention but has now become an embarrassment, and raise it to a more ambitious and meaningful level. This normally involves expanding its size, but we should avoid getting into arguments about permissible size. If an artist offers a set of short stories as his new graphic novel, (as Eisner did with CONTRACT WITH GOD) we should not descend to quibbling. We should ask whether his new graphic novel is a good or bad set of short stories. If he or she uses characters that appear in another place, such as Jimmy Corrigan’s various appearances outside of the core book, or Gilbert Hernadez’ etc. or even characters that we do not want to allow into our’ secret society’, we shall not dismiss the work on this account. If this book no longer looks anything like comic books we should not quibble as to that either. We should only ask whether it increases the sum total of human wisdom. The term ‘graphic novel’ shall not be taken to indicate a trade format (such as ‘trade paperback’ or ‘hardcover’ or ‘prestige format’). It can be in unpublished manuscript form, in partbooks or other serialisation. The important thing is the intent, even if the intent arrives after the original publication. The graphic novelist’s subject is all of existence, including their own life. He or she disdains ‘genre fiction’ and all its hideous clichés, though they try to keep an open mind. They are particularly resentful of the notion, still prevalent in many places, and not without reason, that the comic book is a sub-genre of science fiction or heroic fantasy. Graphic novelists would never think of using the term graphic novel when speaking among their fellows. They would normally just refer to their ‘latest book’ or their ‘work in progress’ or ‘that old potboiler’ or even ‘comics’ etc. The term is just to be used as an emblem or an old flag that is brought out for the call to battle or when mumbling an enquiry as to the location of a certain section in an unfamiliar bookstore. Publishers may use the term over and over until it means even less than the nothing it means already. Furthermore, graphic novelists are well aware that the next wave of cartoonists will choose to work in the smallest possible forms and will ridicule us all for our pomposity. The graphic novelist reserves the right to deny any or all of the above if it means a quick sale.